For thesis class, I wanted to better understand the relationships between my projects in terms of the class assignment, the target audience(s), the deliverable, and the value proposition. For internal clarity, what are the connections, disparities, and overlaps in the landscape of my thesis? Be careful when using icons over labels– are icons necessary, clear, and appropriate? After the presentation and class feedback, I remade the diagram shown above in favor of a gantt diagram. Managing my time versus task load is by far the most difficult part of grad school so mapping the projects versus time would be more beneficial. My inclination to hyper-focus has been a disruption and therefore I struggle with what's being called 'switch fatigue'– interruptions cause a stress response that releases cortisol and the thoughtful-reasoning part of the brain is put to rest. When tasks on the gantt chart are completed, it feels good! Gantt diagram on a 3 foot wide spool of paper. In class yesterday, we were reminded that there are 71 days until the final thesis presentation. This calls for a written reflection on the scope of my projects to consider goals that are realistic, approachable, and manageable. The goal of my thesis work is to increase conservation and show the hidden impacts of common objects based on how we use them. So far, I have created design provocations that examine the relationships between money and time, metrics that portray weights and amounts, and the use-cycle of products. My strategy is to construct a thesis deliverable that is clear and concise to avoid the audience having to take long strides to follow along. By cross referencing the degree of commonality between each of my projects, I aim for consistency. This requires me to shed many or all of the previous semesters deliverables in favor of the overall narrative of my current work. For example, the relationship between finances and the conservation of natural resources is very interesting. I believe that if people stash more money in retirement and savings accounts, they will decrease spending, which in turn lowers the consumption of unnecessary objects. Considering my scope and goals, this direction is currently my weakest link and better to save as a post graduate project. The most reoccurring feedback I've gotten about my overall thesis is to leverage my extensive history as a maker to create physical products that support the final deliverable. I am now manipulating metal wire to build semi-flexible structures and hot-forming plastic bottles to add this back into my work. Now there are 70 days left. Yesterday, Nicole Fenton joined our class to speak about controlled vocabulary and the relationship between a writer and editor. Nicole is a writer, editor, and content strategist. She hosts workshops and works with nice people on websites and publishing projects. As we prepare a 24,000 word (50 page) thesis book, the search to hire an editor has begun. We discussed project budget, pricing structure, rounds of edits, and deadlines. The most important takeaway was making sure my that written work is clear and able to be understood by a non-academic audience–overly technical jargon can be reduced or made clear with the controlled vocabulary section of our final thesis book. This is tough for me because the Products of Design program is teaching us to embrace and use the language that is currently circulated in the design field. Knowing your audience for any output is the tact and skill that I am here to learn be it a blog post, a thesis book, or a presentation to colleagues. Thanks to Abby and Nicole for the guidance! This exercise seeks to realize the intention of my thesis by establishing meaning. A performance continuum is used to map my intent towards a goal and relative to the thesis defense presentation from December. I began by creating juxtaposing the following attributes and ranking them based on how much they mean to my thesis goal. Afterwards, I listed four attributes at the core to my thesis, which were brought up during the team exercise today in class, and ranked their proximity. This two year Products of Design MFA degree is inherently a personal transformation or journey– from my roots as an ornamental and architectural metalsmith– but the intent of my thesis is to exhibit my strengths and weaknesses as a designer so that after graduating, I will be suitably employed in a new career as a designer. You have chosen this thesis topic with the conscious goal to learn new skills sets that are far beyond your established skills as a design and maker of functional luxury furnishings. From your background, there was always a know problem to solve, a fixed material to work in, and the result was a tangible object wrought in collaboration with the clients or patrons that commissioned your services. Now you are self-prescribing the topic to focus on, searching for common problems, and developing possible solutions. The cause and effect of choices and actions you made were extremely tangible and evident in the metalshop. The process of developing a commission from a request to physical manifestation was the most rewarding part– more satisfying than the finished object. Its a good thing that you love process because the process is where most of the time, effort, challenges, and successes reside when working on anything. The beginning and end are but blips on a radar when compared to the duration that is occupied by the process. You are interested in new tool technologies like 3-D printing and software controlled machines, however there are plenty of ways to solve problems that do not require computer software. The primary source of inspiration or interest resides in people’s behavior– the arena that professionals such as psychologists and behavior economists study. When Olivia Newton John's hit song "Physical" made its debuted in the 1980's, you could readily find images of food and beverages compared to a stack of sugar cubes. Although these visuals are compelling, sugar cubes were like lego bricks to me rather than tangible signifiers of how much sugar I was consuming. It is shocking to find these images are at the top of my search results over three decades later. Designers often use other methods for data visualization to emphasize relationships in graphical formats. Like the infographic I made below, the numeric values are emphasized by spacial relationship and size of circles. But have we missed out on other formats that are more universal, tangible, modern, or effective? 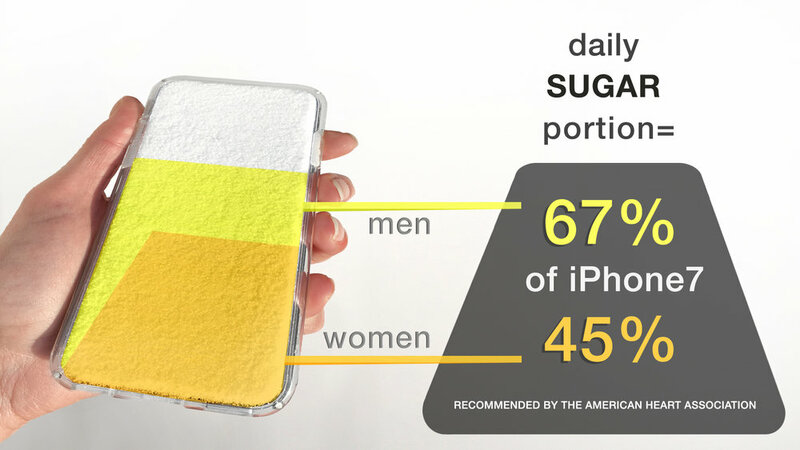 Let's harness the ubiquitous and personal relationship we have with a smartphone and leverage it to convey the recommended and actual consumption of sugar. After all, our hands and mind are intimately aware of this modern signifier. 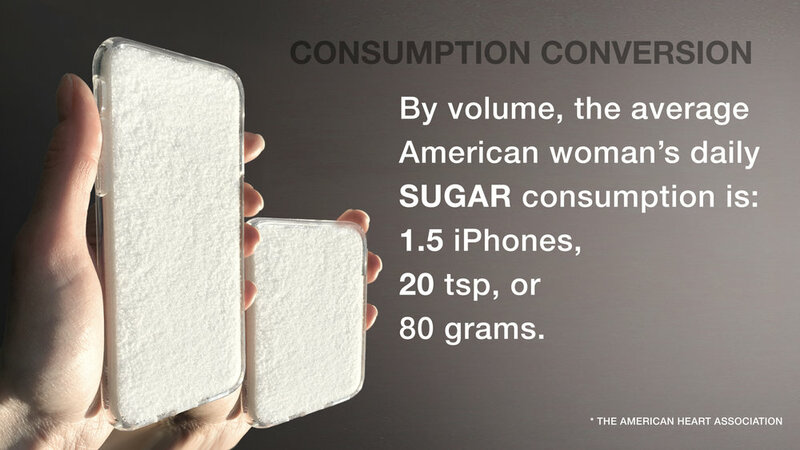 From a young child to an adult, the smartphone is more real than a stack of sugar cubes, a teaspoon, or that illusive measurement of grams or milligrams. Let's make the units that signify our consumption more implicit, visceral, and tangible. Let's make it so people don't have to download an app or even click once to calculate, understand, or convert the percent daily value into to meaning. The last post defined the term nuance and my premise that it resides in our physical and mental perception. Today I will provide an example of nutritional health labels and how they may be missing the smaller, more subtle point, to engage us. The nutritional label system used on packaged food and beverages got an upgrade in May 2016 when the FDA required manufacturers to list added sugar in grams and as a percent-daily-value (%DV). For the past 58 years since the Food Additives Amendment was enacted, sugar content only needed to be displayed in that illusive numeric; grams or milligrams– despite 17 or more other ingredients bearing both numerics. I know a large paperclip weighs about 1 gram but how does this help me understand the daily sugar consumption? It doesn’t add up so easily and the information exchange fails if we don’t comprehend the units of measurement. Although the new sugar %DV is a positive step, how might we introduce new tangible signifiers that grab people's attention and reach new audiences? In 2011 when the Grocery Manufacturers Association created their own 'Facts Up Front' labeling system, it only required a passing glance to see up to 5 values– calories, saturated fat, trans fat, sodium and grams of added sugar. There have been a number of other quick-read signifiers over the years like PepsiCo's SmartSpot, Hannaford Supermarket's Guiding Stars, and the Whole Foods ANDI Rating System. When comparing items on the shelf, these labels allow consumers make health conscious decisions more quickly, right? I am not sure if these labels do more harm than good. On one hand, they provide logical numerics but on the other hand it is similar to what Douglas Rushkoff observes in his book Program or Be Programed in that "not everything is a data point.” He argues that a data-point is a single reference in time and that it doesn’t contain the contextual substance for that particular point. Think of it as the abridged version of Cliff'sNotes. The nuance and understanding reside in reading the entire book rather than just data-surfing. 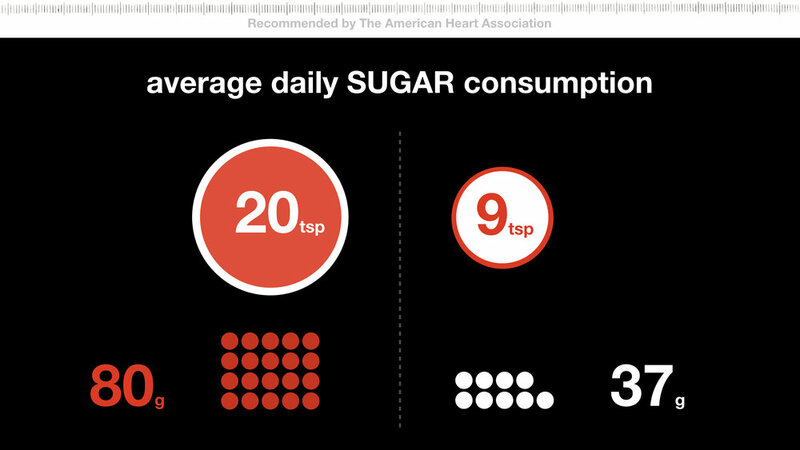 If numbers aren’t providing enough context for making healthier food decisions, then seeing a pyramid of sugar cubes pictured next to a can of soda should help. The shock value from these images is persuasive but they can further the abstraction if you can’t relate to outdated units like sugar cubes or teaspoons. For the first time in recorded history, consumers are spending more money dining out than at the grocery store. As less people prepare their own meals, they have distanced themselves from comprehending a measuring teaspoon– the slow antiquation of a ‘standard’ signifier of portion. There are a wide host of wonderful apps and online sites that help us calculate, track and translate nutritional information and relate it to us in visual manners. I aim to create a conversion method for relating weights and measures to common physical objects– the most intimate of all, the smartphone. I want to provide physical objects that convey weight, percent daily value, and portion into physical form. After all, what is the point of data and facts if people can’t comprehend it?